The assimilation of carbon dioxide from the sunlight, for the process of photosynthesis and then converting it to glucose (energy) synthesizing different product is the key difference between the three. So during the CO2 fixation, when the photosynthetic plants produce 3-phosphoglyceric acid (PGA) or 3- carbon acid as the first product is called C3 pathway. But when the photosynthetic plant, prior going to the C3 pathway, produces oxaloacetic acid (OAA) or 4 -carbon compound as their first stable product is called as C4 or Hatch and Slack pathway. But when the plants absorb the energy of the sunlight at the day time and use this energy for the assimilation or fixing the carbon dioxide at night time is called as crassulacean acid metabolism or CAM. In this content, we will be considering the essential difference between the three types of pathways followed by plants and few microorganisms and a small description about them. Cells involved Mesophyll cells. Mesophyll cell, bundle sheath cells. Both C3 and C4 in same mesophyll cells. Example Sunflower, Spinach, Beans, Rice, Cotton. Sugarcane, Sorghum and Maize. Cacti, orchids. Can be seen in All photosynthetic plants. In tropical plants Semi-arid condition. Types of plants using this cycle Mesophytic, hydrophytic, xerophytic. Mesophytic. Xerophytic. Photorespiration Present in high rate. Not easily detectable. Detectable in the afternoon. For the production of glucose 12 NADPH and 18 ATPs are required. 12 NADPH and 30 ATPs are required. 12 NADPH and 39 ATPs are required. First stable product 3-phosphoglycerate (3-PGA). Oxaloacetate (OAA). Oxaloacetate (OAA) at night, 3 PGA at daytime. Calvin cycle operative Alone. Along with the Hatch and Slack cycle. C3 and Hatch and Slack cycle. Carboxylating Enzyme RuBP carboxylase. In mesophyll: PEP carboxylase. In bundle sheath: RuBP carboxylase. In the dark: PEP carboxylase. Initial CO2 acceptor Ribulose-1,5-biphophate(RuBP). Phosphoenolpyruvate (PEP). Phosphoenolpyruvate (PEP). Kranz Anatomy Absent. Present. Absent. CO2 compensation point (ppm) 30-70. 6-10. 0-5 in dark. Definition of a C3 pathway or Calvin cycle. C3 plants are known as cool-season or temperate plants. They grow best at an optimum temperature between 65 to 75°F with the soil temperature suited at 40- 45°F. These types of plants show less efficiency at high temperature. The primary product of C3 plants is 3-carbon acid or 3-phosphoglyceric acid (PGA). This is considered as the first product during carbon dioxide fixation. The C3 pathway completes in three steps: carboxylation, reduction, and regeneration. C3 plants reduce into the CO2 directly in the chloroplast. With the help of ribulose biphosphate carboxylase (RuBPcase), the two molecules of 3-carbon acid or 3-phosphoglyceric acid are produced. This 3- phosphoglyceric justifies the name of the pathway as C3. In another step, NADPH and ATP phosphorylate to give 3-PGA and glucose. And then the cycle again starts by regenerating the RuBP. The C3 pathway is the single step process, takes place in the chloroplast. This organelle act as the storage of sunlight energy. Of the total plant present on earth, 85 percent uses this pathway for the production of energy. The C3 plants can be perennial or annual. They are highly proteinaceous than the C4 plants. The examples of annual C3 plants are wheat, oats, and rye and the perennial plants include fescues, ryegrass, and orchardgrass. C3 plants provide a higher amount of protein than the C4 plants. 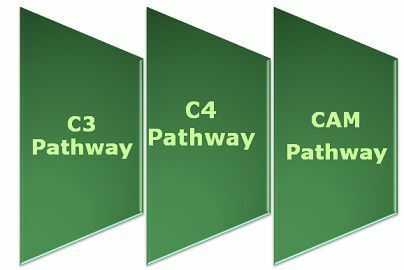 Definition of C4 pathway or Hatch and Slack pathway. Plants, especially in the tropical region, follow this pathway. Before Calvin or C3 cycle, some plants follow the C4 or Hatch and Slack pathway. It is a two step process where Oxaloacetic acid (OAA) which is a 4-carbon compound is produced. It occurs in mesophyll and bundle sheath cell present in a chloroplast. When the 4-carbon compound is produced, it is sent to the bundle sheath cell, here the 4-carbon molecule further get splits into a carbon dioxide and the 3-cabon compound. Eventually, the C3 pathway starts to produce energy, where the 3-carbon compound act as the precursor. C4 plants are also known as warm-season or tropical plants. These can be perennial or annual.The perfect temperature to grow for these plants is 90-95°F. The C4 plants are much more efficient in utilizing nitrogen and gathering carbon dioxide from the soil and atmosphere. The protein content is low as compared to C3 plants. These plants got their name from the product called as oxaloacetate which is 4 carbon acid. The examples of perennial C4 plants are Indian grass, Bermudagrass, switchgrass, big bluestem and that of annual C4 plants are sudangrasses, corn, pearl millet. The noteworthy remark which distinguishes this process from the above two is that in this type of photosynthesis the organism absorbs the energy from the sunlight at the day time and uses this energy at the night time for the assimilation of carbon dioxide. It is a kind of adaptation at the time of periodic drought. This process permits an exchange of gases at the night time when the air temperature is cooler, and there is the loss of water vapor. Around 10% of the vascular plants have adapted the CAM photosynthesis but mainly found in plants grown in the arid region. The plants like cactus and euphorbias are the examples. Even the orchids and bromeliads, adapted this pathway due to an irregular water supply. 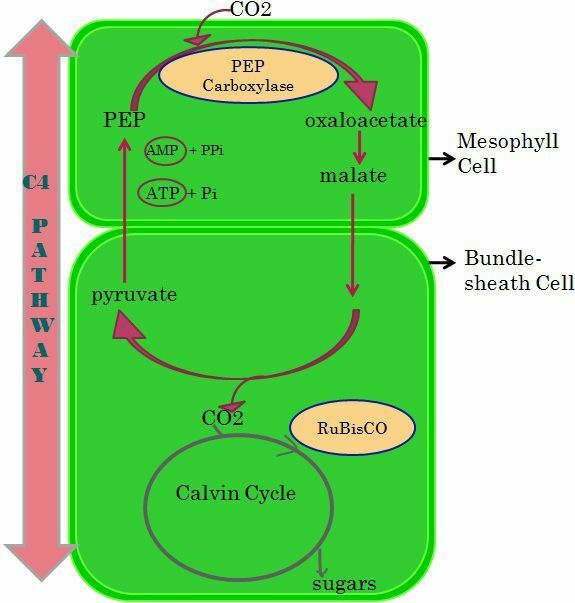 In the day time, malate gets decarboxylated to provide CO2 for the fixation of the Benson-Calvin cycle in closed stomata. The main feature of CAM plants is an assimilation of CO2 at night into malic acid, stored in the vacuole. PEP carboxylase plays the main role in the production of malate. Key Differences of C3, C4 and CAM plants. 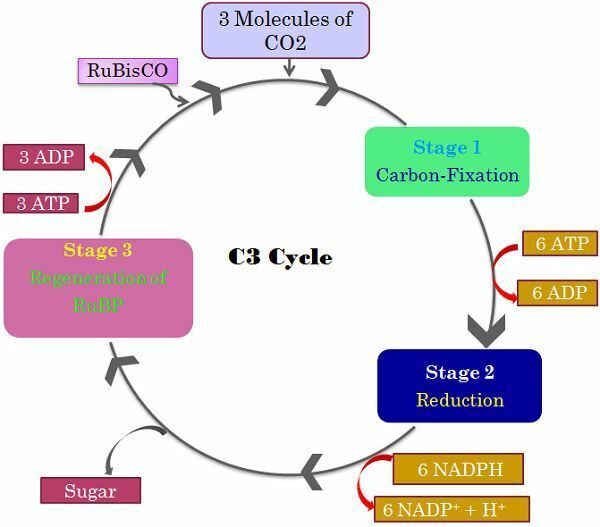 C3 pathway or C3 plants can be defined as those kind plants whose first product after the carbon assimilation from sunlight is 3-carbon molecule or 3-phosphoglyceric acid for the production of energy. It is most commonly used by plants; While plants in tropical area, convert the sunlight energy into C4 carbon molecule or oxaloacetic acid, this cycle takes place before the C3 cycle and then with the help of enzymes it carries the further process of getting nutrients, is called C4 plants and pathway is called as C4 pathway. This pathway is more efficient than the C3 pathway. On the other hand, the plants which store the energy from the sun at day time and then convert it into energy at night follows the CAM or crassulacean acid metabolism. Cells involved in a C3 pathway are mesophyll cells and to that of the C4 pathway are mesophyll cell, bundle sheath cells, but CAM follows both C3 and C4 in same mesophyll cells. An example of C3 are Sunflower, Spinach, Beans, Rice, Cotton, while the example of C4 plants is Sugarcane, Sorghum, and Maize, and Cacti, orchids are the example of CAM plants. C3 can be seen in all photosynthetic plants, while C4 is followed by tropical plants and CAM by Semi-arid condition plants. Types of plants using C3 cycle are mesophytic, hydrophytic, xerophytic but C4 is followed in mesophytic plants and Xerophytic follows CAM. Photorespiration is present in the higher rate while it is not easily detectable in C4 and CAM. 12 NADPH and 18 ATPs in the C3 cycle; 12 NADPH and 30 ATPs in C4 and 12 NADPH and 39 ATPs are required for the production of glucose. 3-phosphoglycerate (3-PGA) is first stable product of C3 pathway; Oxaloacetate (OAA) for C4 pathway and Oxaloacetate (OAA) at night, 3 PGA at daytime in CAM. 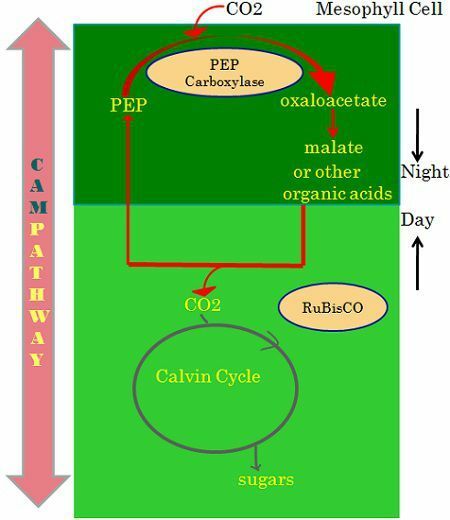 Carboxylating Enzyme is RuBP carboxylase in C3 plants, but in C4 plants it is PEP carboxylase (in mesophyll) and RuBP carboxylase (in bundle sheath) while in CAM it is PEP carboxylase (in the dark) and RuBP carboxylase (in light). CO2: ATP: NADPH2 ratio 1:3:2 in C3, 1:5:2 in C4 and 1:6.5:2 in CAM. The initial CO2 acceptor is Ribulose-1,5-biphophate(RuBP) in a C3 pathway and Phosphoenolpyruvate (PEP) in C4 and CAM. Kranz Anatomy is present in the C4 pathway only, and it is absent in C3 and CAM plants. The CO2 compensation point (ppm) is 30-70 in C3 plant; 6-10 in C4 plants and 0-5 in the dark in CAM. We all are aware of the fact that plants prepare their food, by the process of photosynthesis. They convert atmospheric carbon dioxide into plant food or energy (glucose). But as the plants grow in the different habitat, they have different atmospheric and climatic condition; they differ in the process of gaining energy. Like in case C4 and CAM pathways are the two adaptations arose by natural selection, for the survival of the plants of high temperature and arid region. So we can say that these are the three distinct biochemical methods, of plants to obtain energy and C3 is the most common among them. Thanks for this beautiful article, it helped a lot!